I recently gave you a tour of my sewing studio. Here are links to parts one and two of “The Grand Tour.” <grin> Today, I conclude by showing you where I actual do some sewing! Before we start, here’s a map of my studio again. First up on the tour is my cutting station. I have two—here is the large one located over my fabric scrap baskets. Say hello to Harriet. I made her with my bee mates last year. She’s a pin cushion, but I rarely use her as such because I can’t bear to stick pins in her. I have a second, much smaller cutting station next to my ironing board. I seem to use this one a lot. Like real estate, it’s all about location, location, location—this cutting station is right next to my desk and my sewing machine. The ironing board rests on top of this wonderful IKEA piece—a Kallax shelving unit. You can purchase wheels for the shelving unit if you want, and I did, so it’s easy to move away from the wall when needed. On the right, I store an extra cutting board, an art board, and the top of my portable pressing table--it fits on top of an ordinary folding table and I love to bring it to sewing retreats. You can also purchase fabric drawers for the shelving unit and I did that too! Inside those drawers I keep small scraps of batting for small projects, ironing supplies (portable iron, Best Press, pressing cloth), and postal supplies (I participate in online swaps, ship prizes for my quilt alongs, and occasionally make and ship quilt samples for patterns I’m writing/editing for fabric manufacturers). I have open shelves in the unit, and there I keep my laptop, camera, printed patterns, and fusibles/stabilizers/interfacings all organized for easy access. I had planned on putting my portable sewing machine on one of these shelves, but instead I find that keeping it in its rolling case is more convenient since I never use it at home. At my desk, I write blog posts and design patterns. I also test patterns for fabric manufacturers which is why this post is late! I'm very busy leading up to Quilt Market as you can imagine. At my desk I can look out the window and even watch TV while working if I want. I like old movies so I’m a big TCM fan. To the left of my desk is my sewing station. I have a horizontal filing cabinet that contains purchased patterns and such. It serves as an extra desk area for keeping current projects close at hand yet out of the way when I'm not working on them. The cabinet also helps to support a quilt when I’m quilting. That’s it! Thanks for coming by. I hope you enjoyed the tour. Later in the week, I’ll be announcing the details of my upcoming quilt along. I’ve got a sponsor so there will be a great prize every week, and I’m hopeful about a second sponsor. I hope you can join us! Welcome to My Sewing Space! Tell me…what do you like best about your sewing studio? What changes would you make if you could? Let me refresh your memory of my sewing space. Next to my black chest of drawers, I have a wall of bookcases. I use two of them to store my fabric. As you can see, I organize my fabric mostly by color, starting from neutrals (in the lower left) and moving through browns, yellows, oranges, reds, pinks, purples, blues, and greens (on the right). Certain fabrics are organized by style, such as orientals, 30's, pets, holidays (like valentines and St. Patrick's), patriotics, Christmas, novelties, and my growing collection of solids. I love black and whites, so I keep them together too. I also have a good collection of black and gold fabrics, and I used them to make a quilt for Katerina's choir director. They were perfect for a star-filled sky! On top of the fabric bookshelves, I store large batting scraps, my thread collection, lamps, my old sewing box with sewing notions, and fleece. To store my fabric scraps, I purchased this little beauty from IKEA. They call it Anotonius, but I call it awesome! It fits just under my sofa table, which I use for my cutting station. Each drawer is filled with scraps, organized by size--under 2-1/2", between 2-1/2" and 5", and over 5". Every so often, I cut up some scraps and store them in these nifty organizers, also purchased at IKEA. I want to cut up all my scraps at some point, but for now they are at least organized by size. Once they are cut, I want to organize them not only by size but by color as well. Now for my WIPs. I have tons of them, so no judging! <grin> Last time I showed you that WIPs I’m actively working on at the moment are stored right at hand, on top of my black chest of drawers. As you can see, I'm currently quilting two quilts, and actively piecing two quilts. Other works in progress I’ve organized each in their own storage box, labeled of course! These are so numerous I have them in two places. The first area is above and below my tool storage, on a bookshelf that’s on the same wall as my fabric bookshelves. This bookshelf also holds my uncut batting (on top) and my magazines (below). Each box has a label that tells me the name of the project along with a list of the things that still need to be done, such as applique, piecing, adding borders, and so on. Other projects are stored, just to the right of the line of bookshelves, on a smaller bookshelf that also houses my quilt books. On top of this smaller bookcase, I have my precut collection, buttons, quilt show buttons, and Guild name tags. Yes, I have a lot of name tags but it isn’t because I can’t remember my name! <grin> Our guild usually gives each retreat participant a new name tag that fits the retreat theme, and I’ve gone to a lot of guild retreats. Tucked into the corner there on the right is my collection of fabric bags, acquired at quilt shops, retreats, shop hops, and the like. Always handy! I think that’s it for now. Thanks for stopping by my studio! Come back next week as I continue the tour by showing you my pressing station, sewing area, and another awesome IKEA piece. Meanwhile, be sure to stop by Melva Loves Scraps for links to lots of other studio posts! Tell me…How do you organize your stash? By color, by type? What about WIPS and scraps? Do you cut them up or organize them by color? As you know, I participated in the New Quilt Bloggers Blog Hop earlier this year. 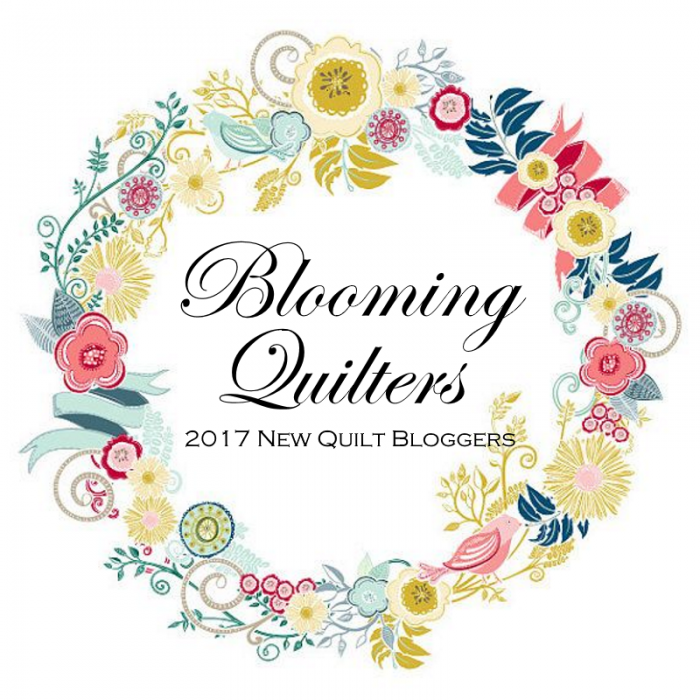 Through it, I met a great group of new quilt bloggers like me. One of our group--Melva of Melva Loves Scraps—got the brilliant idea of showing off her sewing space this week and she invited her fellow New Quilt Bloggers to join in the fun! Since I’d been thinking of showing you my sewing space for some time, I said “Heck yeah!” to her invitation. My sewing “studio” is actually a room over our garage. I share the space with my husband, a self-employed technical journalist who works at home like I do. “Share” is a bit of a stretch, as I’ve slowly been taking over the majority of the room upstairs. He doesn’t mind at all, enjoying the color and art my quilting brings to our office. Isn’t he the best? When I made up my mind to get serious about this quilting business, I decided that the first thing I needed to do was to reorganize my space to accommodate both quilting and blogging. So of course I came up with a plan! (I’m a planner, not an “improv”er, in case you didn’t know. <wink>) Here’s my first plan. You'll notice that my desk is strategically placed by a series of windows. I love a view, even if that view is of my driveway. First I measured out the room, then I created a floor plan. Next, I measured each piece I was going to keep, like my desk and the bookshelves, and started moving them around the room looking for an optimal arrangement. Moving bits of paper is way easier than the actual stuff, and I had fun playing with paper. Then I happened on a blogger who used some IKEA pieces to create a cutting table and fabric storage, and I was all over that! We don’t have an IKEA here yet (it’s coming soon!) but we have one just a few hours away so buying the IKEA pieces was totally doable. Here’s my modified plan, and how my space looks now. We haven’t replaced Scott’s desk yet, so it still sits at an angle to the window in the upper right corner. I ended up with the filing cabinet we were going to put by Scott's desk, and I added the IKEA pieces to the plan. When I was writing this “tour” I realized that it would take a while to show you the details of my space. So I’ll conduct the tour using a couple of posts. Today, let me show you my design wall and tool storage. I had been looking for some time for the ideal place to hang my design wall. It wasn't until I sat down to plan my studio space that it hit me! If we moved a bunch of things away from the wall by the stairs, my design wall would just fit! As you can see, the design wall is in pieces. I made it by covering two foam core insulation boards with batting. The boards were too big to fit into our car, so we had Lowes cut each one in half. That decision used to frustrate me because my plan for putting the pieces back together once we got them home didn’t work out as I would have liked. But as you can see now, it’s genius because it made the process of trimming and fitting the design wall into place that much easier. I hung the two top pieces using Contact strips, and trimmed the lower pieces so they fit exactly underneath. The bottom pieces are held in place on their own. I had several things I had to cut space for, such as the light switches and the smoke detector. I did not cut around the air vent however, opting instead to simply move the wall out of the way most of the time, and putting it in place only when I need to lay out a really large quilt. The total dimensions of my design wall are 93” x 96” (we trimmed a bit off the left side). As you can see, I didn’t waste any time putting some of my projects up on the wall and using them to decorate my space. To the left of the design wall, I have a small black chest of drawers I inherited from my mom. I love that it still has some 1970's style decals she used to decorate it. On top of the chest, I’ve placed two quilts that are in the quilting stage—my Gradations Charming Stepping Stones and my Pulse quilt. To the left are projects I’m actively working on right now (other WIPs are stored elsewhere…I’ll show you in another post how I organize them). Right now, active WIPs include my Shadow quilt, Vincent art quilt, and a Tula Pink version of Brickyard. In the top drawer of the chest, I store freezer paper for applique and some HST sheets for easily making large quantities of the same color HSTs. The top drawer on the left holds my embellishment tool and mini craft iron. The bottom drawer is filled with foundation papers and printable fabric sheets. The big space on the right holds a bunch of stuff I don’t use often—beads, specialty rulers, Bubble Jet Set, template plastic, and a ruffle foot for my sewing machine. I’ll end this part of the tour by showing you where I keep the rest of my tools. I have several bookcases, and on one shelf, I’ve organized my tools by category. I have a box for quilting tools such as safety pins, masking tape, quilting stencils, Golden Threads paper, and gloves. I have a box for cutting tools, such as extra blades, safety glove that I got for my daughter when she was first learning to quilt, extra rotary cutters I’ve won as prizes, and various scissors. I have a box for needles and hand-sewing tools, and another for craft supplies/embellishments. I have a box for sewing stuff (machine oil, old pincushions, old pins), a box for marking tools, and another for muslin hanging sleeves I use when I'm entering quilts that don't already have sleeves into shows. I also have a box for zippers and purse making materials. I have a lot of boxes, as you can see! But it sure makes it easy for me to find the right tool when I need it. I store my rulers, extra cutting mat, rotating cutting mat, and portable cutting mat/pressing station in this organizer. I’m not sure how I acquired this beauty, but I think I won it at a quilt retreat. Sure does make storing these overlarge tools easy, and it's easy to move out of the way when needed. Well, that’s it for now. Be sure to stop by Melva's for links to the other bloggers who are participating! And be sure to come back later in the week when I continue the studio tour by showing you how I organize and store my fabric and WIPs. Tell me…do you have a design wall? How large is it and does it suit your needs? How did you make it?